February 11, 2011 marked the 100th day of this school year and classes all over Forsyth County did a myriad of activities all involving the number 100. At Kimmel Farm Elementary the first grade students and teachers took celebrating the 100th day as a time to give back to the community. 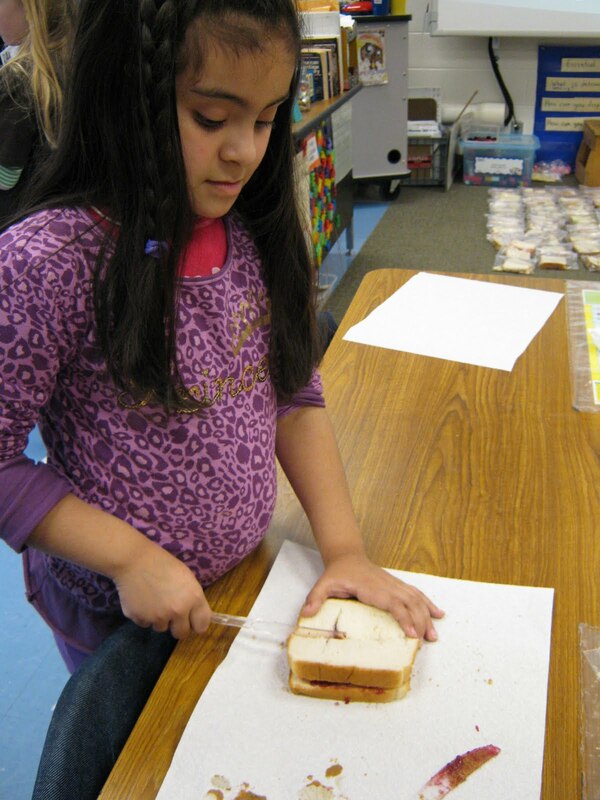 The first grade team (Ms. Raiford, Ms. Brodeur, Ms. Stowe-Hosch, Ms. Miller, Ms. Hayes-Foutty, Ms. Kibler, and Ms. Terreni) all got their students engaged in making 100 sunflower butter and jelly sandwiches to help the homeless. One student in Ms. Raiford's class said, "I feel great doing this because I'm helping people I know need the help." Another student from the same class said, "It feels good helping the homeless people." According to a story in the Winston-Salem Journal, the Triad’s job market improved slightly during December, with the unemployment rate declining 0.2 percentage points to 10 percent, as reported by the N.C. Employment Security Commission at the beginning of February. The Forsyth County rate fell to 9.1 percent from a revised 9.4 percent in November. Our community is in need. "I've been doing this for about five years now, " said teacher Denise Brodeur. "I just have a passion for helping people who don't have anything, so I like to teach we do for ourselves, and we do for others. When we do this we learn about 100, and we celebrate the 100th day of school, but we're also giving back to others. It's a great character education as well as math lesson for our students." 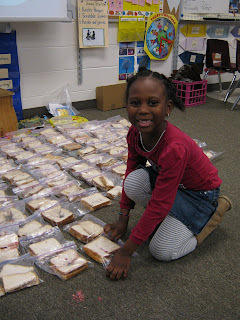 Students work to make 100 sandwiches which are then delivered to Samaritan Ministries in downtown Winston-Salem. Samaritan Ministries is an interdenominational, volunteer based Christian ministry in Winston-Salem/Forsyth County serving hungry, homeless and people in need, 365 days a year. Their programs include: Samaritan Soup Kitchen, Winston-Salem’s only soup kitchen, Samaritan Inn, a 69 bed homeless shelter for men, and Project Cornerstone, a residential substance abuse recovery program for men.